All information relating to school transport, can be found on the Suffolk On Board website. 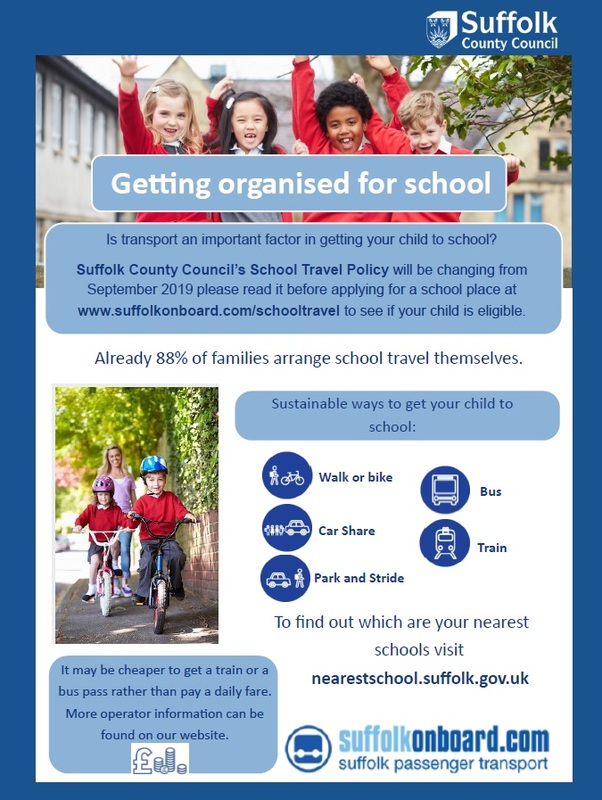 Suffolk County Council are introducing changes for arranging transport to schools for children from September 2019; this includes adjustments to the transport ‘catchment areas’ they will be using. It will remain the responsibility of parents to make appropriate arrangements for their child’s travel to school, whether this be walking, cycling, car or public transport; in certain circumstances, Suffolk County Council may be able to offer some assistance but unfortunately, schools themselves (including Ormiston Sudbury Academy) are not involved in these arrangements. Where students live over 3 miles from their transport ‘catchment’ (i.e. nearest) school, Suffolk County Council will provide free transport to that school; they will continue to try and support families that are eligible (and registered) for Free School Meals. The Suffolk County Council transport website is the best place for information www.suffolkonboard.com and to check eligibility and if there are any parental concerns or queries regarding transport for their child(ren), they are also advised to contact Suffolk County Council (and not the Academy) in the first instance.